(i) 25° (ii) – 47°30′ (iii) 240° (iv) 520°. Therefore, 25° = 5π/36 radian. Therefore, 240° = 4π/3 radian. Therefore, 540° = 26π/9 radian. (i) 11/16 (ii) -4 (iii) 5π/3 (iv) 7π/6. = 39° + 22' + 30"
11/16 radians = 39° 22' 30". = -229° + 5' + 27"
-4 radians = -229° 5' 27" approximately. Question-3 :- A wheel makes 360 revolutions in one minute. Through how many radians does it turn in one second? In one complete revolution, the wheels turns an angle of 2π radian. Hence, in 6 complete revolutions, it will turn  an angle of 6 x 2π radian. Thus, in one second, the wheels turns an angle of 12π radian. Question-4 :- Find the degree measure of the angle subtended at the centre of a circle of radius 100 cm by an arc of length 22 cm (Use π = 22/7). We know that in a circle of radius r unit, length of arc l and angle θ. The required angle is 39° 36'. 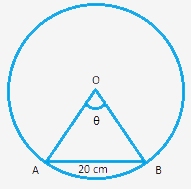 Question-5 :- In a circle of diameter 40 cm, the length of a chord is 20 cm. Find the length of minor arc of the chord. length of minor arc of chord = ? Let AB be a chord(length = 20 cm) of the circle. Thus, ∆AOB is a an equilateral triangle. Length of minor arc of chord is 20π/3 cm. Question-6 :- If in two circles, arcs of the same length subtend angles 60° and 75° at the centre, find the ratio of their radii. Let the radii of two circles are r₁ and r₂.